By day ten of our vacation we knew that going home was drawing near. 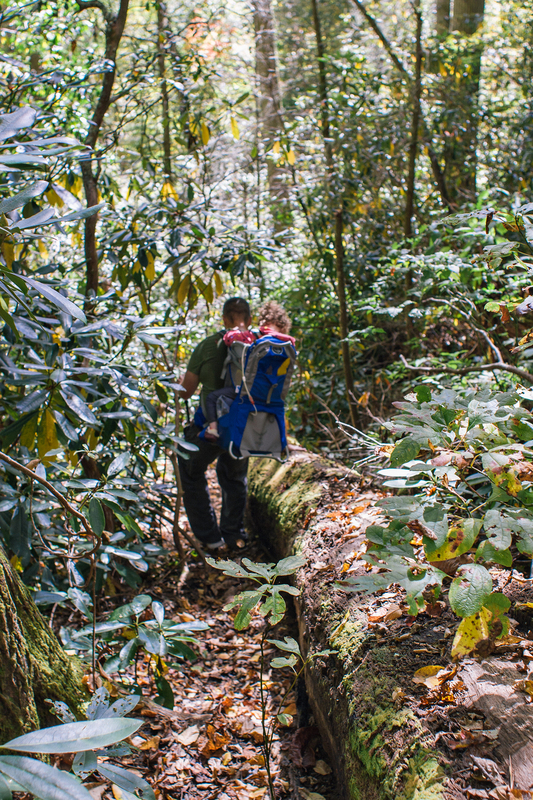 That day we decided to go hike Linville Gorge. Initially, we wanted to go to the Linville Falls visitor's center that is located just off of the Blue Ridge Parkway, but again, it was closed due to the government shutdown. There were cars lining the edge of the parkway, and people walking into the visitor's center from the road. We decided not to chance it since we didn't know how far the walk would be. 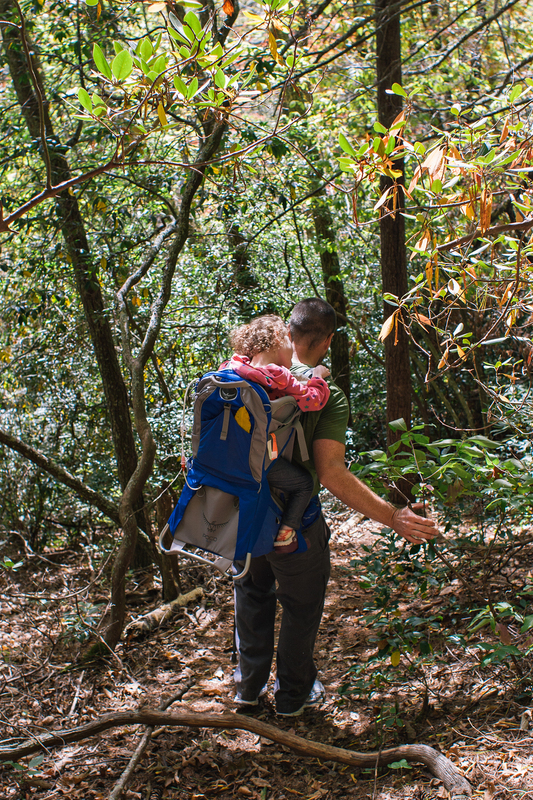 We've hiked the Linville Gorge area twice before, but never with the Osprey Poco carrier. 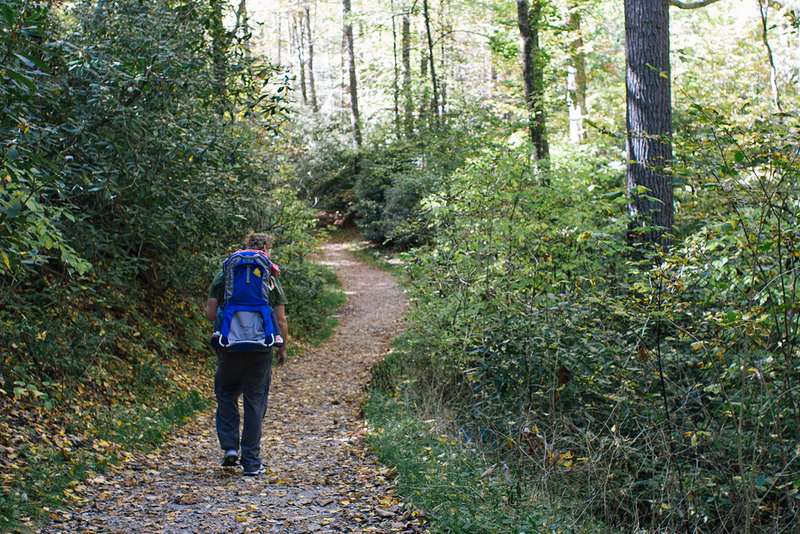 The hike is accessed from a road in town, and so we went with what we knew. After the evening that we had at Mt. Mitchell the night before, we were a little bored with this hike. It is pretty flat and it has wide trails. Not much of a challenge really. We were still grateful for the scenic beauty though. Maybe we were searching for new and exciting territory since we had been there and done that a few times already? 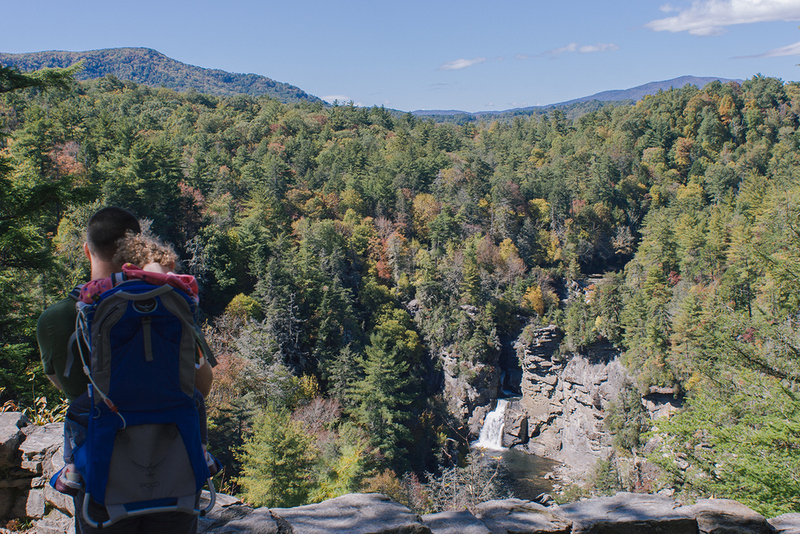 We took the main trails to their scenic overlooks, looked at Linville Falls and its 90ft. waterfall at three different levels. This took no time at all to finish. Caleigh slept through the whole thing. It was her nap time after all. We then decided to try and find some hidden, off the beaten path kind of trails. Caleigh was awake by this time so we definitely wanted to show her more of the gorge. We didn't walk far from the top overlook, when we came across a semi-marked trail. We started heading down it, and by down I mean straight down. It descended extremely fast and it was hard to keep our footing. There wasn't any pansy switchbacks to this beauty. 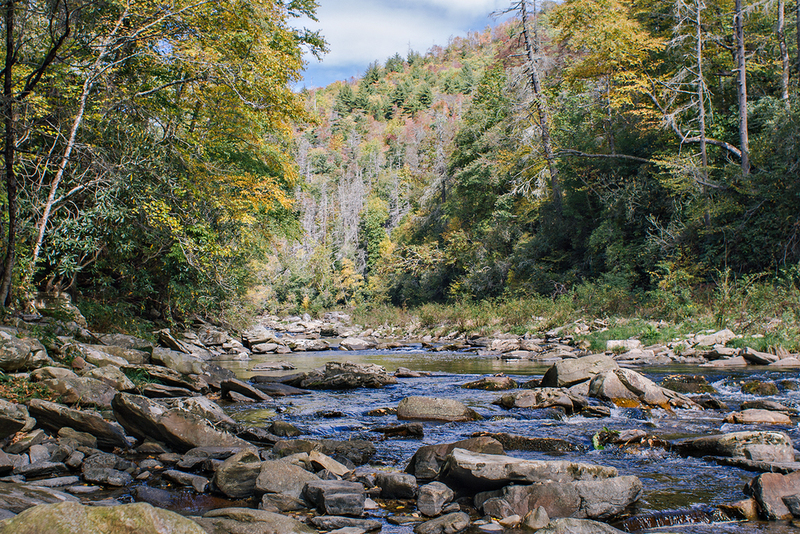 We made it to the bottom of the Linville River gorge in no time at all. Maybe fifteeen minutes at the most. The view was stunning. It was quiet, peaceful and magnificent. 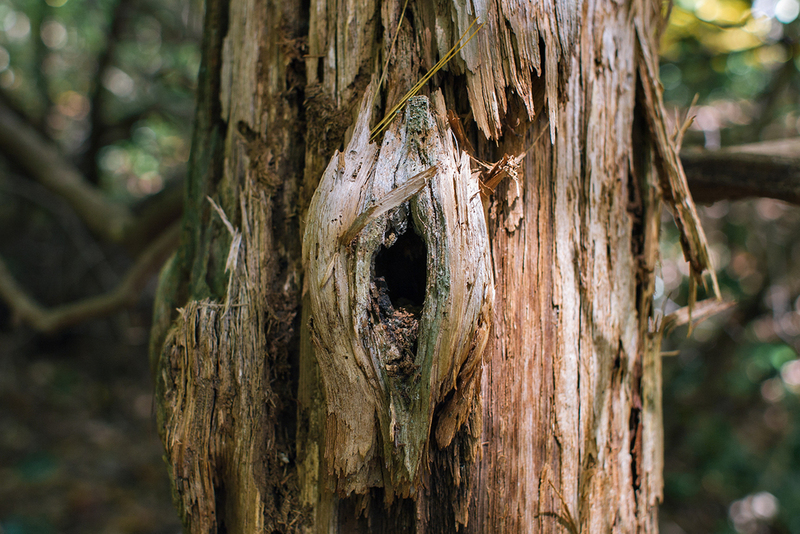 We sat on large boulders, talked about the area's history and soaked in all the solitude. We tried to image what it would have been like to be the first person to discover such an amazing site. The calmness is something that I can remember right now as I type. There was no normal vs. not normal. Just us, the trickling water and nature. The climb back up was intense and a lot of fun. Eric found me a nice stick to use as a hiking pole. I needed it. This trail and it's amazing reward at the end fed our hunger for new and exciting.